Roberto Escobar, brother of the late Colombian drug trafficker Pablo Escobar, wants to review the second season of the Netflix series "Narcos" before it airs, according to a letter acquired by gossip site TMZ. In what he described as a "friendly request for co-operation," Escobar also asked Netflix for a share of the profits from the show in a letter dated July 1. "It is my wish that you do not release any Narcos television show or any other show or shows depicting me, my family or my brother Pablo Emilio Escobar Gaviria, unless I am given the rightful opportunity to review this material," he wrote. Escobar, who worked as Pablo’s accountant, adds in the letter that he's "one of the few surviving members of the Medellín cartel." Escobar Inc. CEO Olof K. Gustafsson said the company tried to contact Netflix but didn't get a response, Variety reported. In an interview with Newsweek today, Escobar said he wants $1 billion in compensation from Netflix. “If they decline my offer we have attorneys ready to proceed with necessary actions,” he said. 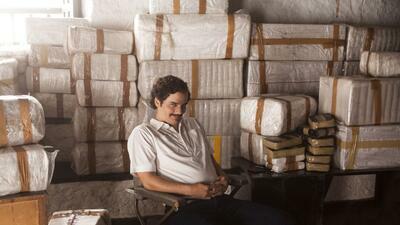 “I don't think there will be any more Narcos if they do not talk to me. You have to pay to play, and they are playing me without paying."